Dianthus comes in many different varieties and is commercially grown and available throughout the year for your floral needs. No longer just for personal gardens, they have seen its use in floral arrangements, wedding bouquets, table centerpieces, floral balls, and much more. Choose from the unique Green Trick or Green Ball which is a whimsical, fluffy flower, used increasingly in today’s centerpieces and floral arrangements. Alternatively, our traditional line has flowers with notched petals that form flat, round blooms, coming in assorted colors such as red, white, cherry, purple, coral, and rose. With either choice you can be sure of the freshest blooms to brighten your special day or event. 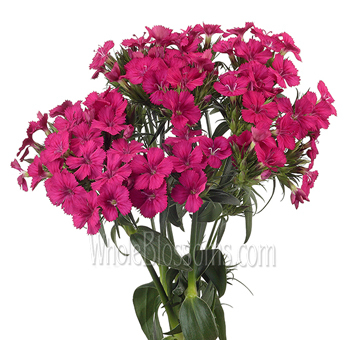 Dianthus flowers are known for their delicate, durable, and delightful nature. The flower carries a rich history with profound significance. The name of the flower means the flower of love or the flower of the gods, and it has been revered for centuries. It is regarded as one of the oldest and most cherished flowers of all times. The flower is known for its distinct appearance and scent with a long blooming period. Dianthus blooms are mostly found in the regions of Asia, the Mediterranean, and even the Balkan Peninsula. They have a wide range of annual to biennial and perennial species. The white dianthus flowers are lauded for their subtle presence. The name of the flower is derived from the Greek word, dio, which means ‘god’ as the name was given by a Greek botanist. The flower smells like a clove tree as they are a descendant of the Caryophyllaceae family. 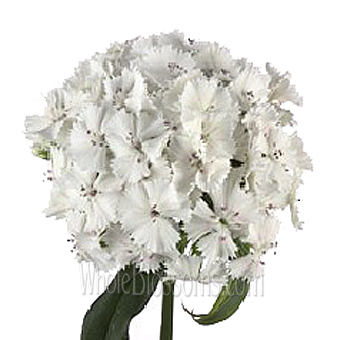 You can get your hands on wholesale dianthus for sale from trusted online florists like Whole Blossoms. These flowers can be used for edging beds and containers with their vibrant pink colors. There are many crosses of the flowers which are known for their unusual characteristics. The double and frilly flowers are appreciated for their strong scent and elegant appearance. 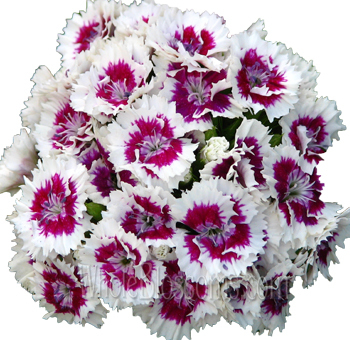 White and red dianthus flowers represent immense admiration, love, and affection and are great for special occasions. They also symbolize purity and luck, and pink blooms stand for a sign of gratitude. During the early 20th century, these flowers were named as the official flowers to represent Mother’s Day. The flower carries different meanings in various parts of the world. The flower is assumed to have over 600 species, spreading to be about 2200 types spread all over the world. Dianthus flowers are also called as pinks. They belong to the carnation family and are mostly known by their spicy fragrance. These flowers can be found throughout the year and are frequently used in potted displays and arrangements. Many varieties of white dianthus can be the perfect fit to make a charismatic statement. The versatility of the flower is widely appreciated with its graceful presence. 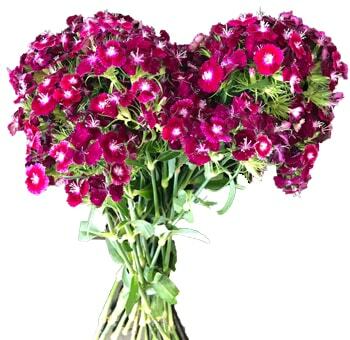 The flower also goes by the name of Sweet William which has a signature smell of clove notes or even cinnamon. The flowers are small, and the height can range from six inches to 18 inches in total. 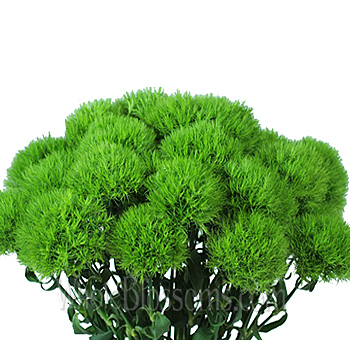 The different ranges of green dianthus have the capacity to capture the attention of anyone. Dianthus foliage is very slender with thick stems which are spread sparsely. The annual variety of the flower goes by the name of Dianthus chinesis, which is called as Chinese pinks. The perennial type of the plant includes many species like Cheddar, Grass pinks, and Cottage. The foliage is different for each of the variety which can be blue or gray to a rainbow of colors. These flowers are very long lasting and can stay up to eight weeks. They come as double flowers with a varied range of sizes. The ragged pink variety of Dianthus can impress any onlooker as it an evergreen plant, the scientific name of the flower is Dianthus seguieri. Where to buy dianthus flowers Online with the best quality? 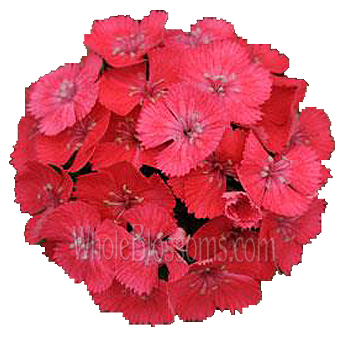 Find fresh dianthus flower arrangements from trusted online florists like Whole Blossoms. Get your hands on wholesale dianthus for sale with fresh blooms and odor. These recognizable flowers possess a unique charm that can surprise anyone. The captivating nature of the flowers is very alluring and is famous all over the world. They have the capacity to surpass the beauty of roses even with their powerful symbolism. 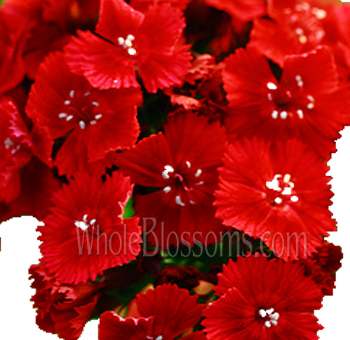 Red dianthus flowers can be the perfect additions to any floral arrangements. They can complement with their elegant beauty with the long-lasting nature of the flowers. Dianthus has proven to be one of the best choices for flowers with its distinct appearance and life-span. Put your trust in reliable online floral shops like Whole Blossoms to deliver you with fresh arrangements. If you wish to buy bulk flowers, you can easily order it online with a single click. 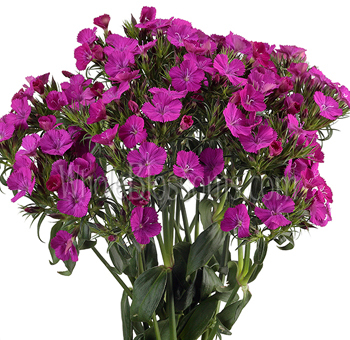 You can receive assembled arrangements of Dianthus with fast delivery options. These flowers can bless any special occasion with their lovely nature. The freshness of dianthus is matchless, and hence, it stands to be the perfect flower if you have a unique taste. You can come up with creative ideas to set it up with your floral arrangement choices. Select from a wide range of vibrant and beautiful color choices of the flower. The flower manages to radiate an immense amount of love and affection with its presence and unique flair. The sweet and exotic odor can surprise anyone easily along with its dominant colors.